Can Detroit Build Small? Chevy Tries With Cruze General Motors used to push SUVs and trucks. But now, the leaner, post-bankruptcy GM is turning its attention to small cars to compete with Toyota and Honda. And it's hoping the Chevy Cruze will woo customers with a price tag that starts around $17,000. 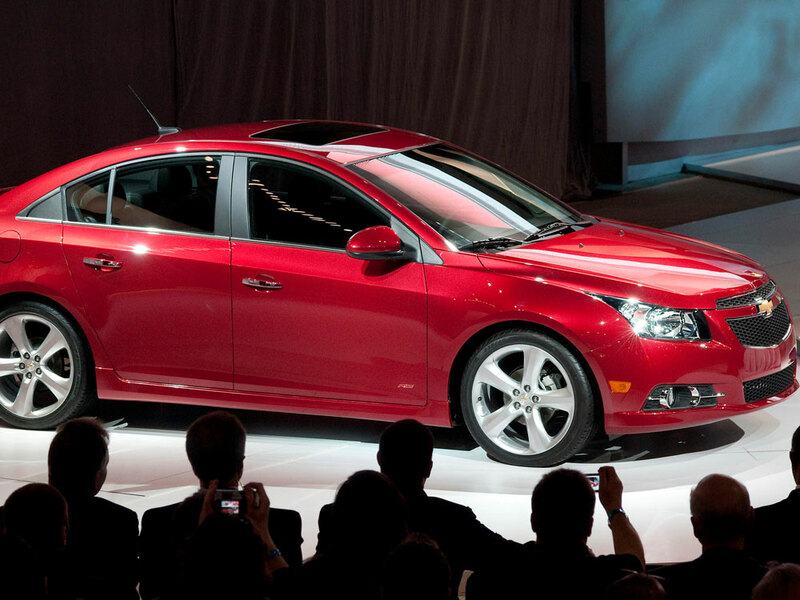 Chevy hopes it can gain some momentum in the small-car market with the Chevrolet Cruze. But it will face competition from Ford, Honda and Toyota. The Chevrolet Cruze -- a small car with a coupelike design, an upgraded interior and lots of air bags -- also comes fully loaded with high expectations. "I think it goes without saying that Cruze is probably the most important passenger car that both Chevrolet and GM have ever done," says Margaret Brooks, the head of marketing for Chevy's small cars. But since when does General Motors -- the company that pushed SUVs and trucks so hard for so many years -- care so much about small cars? "Small cars built by Detroit — by Detroit car companies — were just not competitive," says Jeremy Anwyl, CEO of Edmunds.com. "What the Cruze represents for Chevrolet in particular, but also I think for the U.S. auto industry, is kind of a demonstration that, yeah, maybe Detroit can build small cars." In past years, GM was fairly content to let the Toyota Corolla and Honda Civic duke it out, while it sold poorly reviewed compacts at deep discounts. That's no longer the case for the new, leaner, post-bankruptcy GM. The Cruze is supposed to be its white knight. With taxpayers still owning 61 percent of GM and a stock offering in the works, the Cruze is the company's most important launch in years. For a car that starts at about $17,000, Eric Tingwall, an editor for Automobile magazine, is impressed. "It's not necessarily fast, but it is a turbocharged engine where you get torque down low," he says. That means it takes off nicely from a stop. GM says some models can get as much as 40 miles per gallon. Tingwall surveys the Cruze's modern interior, which has 10 air bags and an upgraded stereo. He says the dash looks like the kind you'd find in a more expensive car. "If you look at the quality and the style here, you won't find anything like that in the Toyota Corolla or Honda Civic," Tingwall says. But you can also buy a basic Corolla or Civic for less than a new Cruze -- about $1,000 less. And GM may have to persuade some customers to forget about the Cruze's predecessors -- the Cobalt and Cavalier. "I'll probably never buy another Chevy," says Megan Robison, who now owns a Honda Civic. "I had a Cavalier and I just wanted something more reliable." Next time she's in the market for a car, she says, she'll most likely get another Honda. Brooks, the Chevrolet marketing executive, admits that the company has some work to do to win back customers. "Certainly if we look back [at] the last couple years -- decades really -- we kind of lost our way a bit with Chevy," she says. And while many reviewers think the Cruze is the best small car on the market today, that sentiment might not last long. Toyota, Ford and Honda are all due to come out with their redesigned small cars in the next 12 to 18 months. The story was produced by Changing Gears, a collaboration of WBEZ Chicago, Michigan Radio, and ideastream Cleveland.